Greentopia > Green Visions > If it’s February, it’s time to get green. Green Visions, that is. February is Green Visions month! Just as people in are turning to seed catalogs to dream about what they’ll grow in the spring and summer, Greentopia is planting new “seeds” to ensure that Green Visions continues to thrive. And, by the way, they’re also ordering seeds. Until now, this workforce development and neighborhood beautification program has been supported primarily by grants and gifts. But grants tend to be short-lived and often unrenewable. That’s true whether the program has measurable success, as Green Visions does or not. So Greentopia is taking the month of February to work on making make Green Visions more sustainable financially. What does that mean? First, imagine changing someone’s life for $3,500. That’s what it costs to provide professional landscaping, construction, and safety training for one Green Visions worker, as well as a stipend for 20 hours of work per week for 20 weeks. 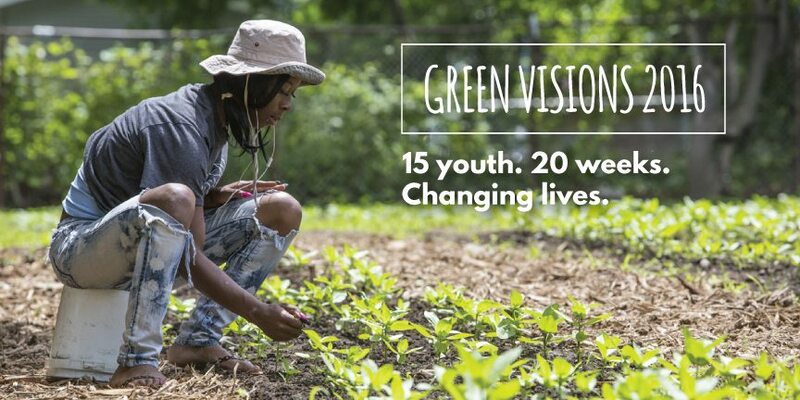 The young people who complete the Green Visions program come from one of the poorest sections of Rochester, where jobs and job training that can lead to greater things are often pretty scarce. “It’s not just that these kids will be ready to do landscaping. They’ll be ready to work,” said Michael A. Philipson, co-founder of Greentopia. Sponsorships will include perks, such as a community-service or team-building opportunities on site for the sponsoring company or group, and display of the company’s logo on signage at the Green Visions sites and in publicity materials and online. “Ideally, we’re hoping that businesses large and small will look at it as an opportunity for sponsorship,” said Morgan Barry, manager of Green Visions. Businesses or individuals who can’t afford the full price to sponsor one trainee would be welcome to sponsor at more modest levels, Philipson said. Acting on the Green Visions business plan. Expanding the value and varieties (50 instead of a dozen) of flowers grown on site. Talking with current retailers of Green Visions bouquets about expanding sales to other stores. Connecting with florists who will buy in bulk at wholesale prices. Modernizing methods, such as irrigation and fertilization, to free up workers to handle more profitable duties. All in all, it’s a great month to be green.